There and here, or almost everywhere, we found articles forcing to work on a specific topic or niche to grab higher ranking opportunities for your blogs in SERP's. But it is not true. Yes, I am saying it's not true, it's just a myth. I am not criticizing those bloggers or SEO experts who say like above, but we all know that Google and other major search engines always make changes in their ranking algorithms. Even they make little changes on daily basis. Search engine always try to provide better results to their users who are searching something using them to find appropriate and valuable piece of information. For a single topic or query, we search in search engines and as a result, they show us a large number of lists (In lacs or sometimes in crores). Now the web owners always try to rank their articles on the first page. For this purpose, experts suggest them SEO techniques like building quality links, writing quality contents and so many other tactics to rank in search engines. 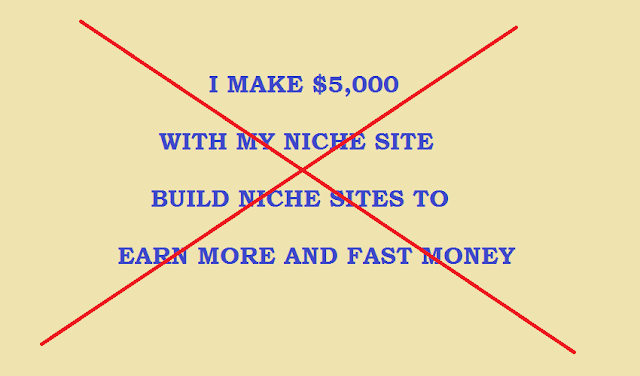 Working on a specific niche is one of those SEO techniques. But I do not fully agree with this statement. A niche website is a website that Focuses on Specific Information that is Both Useful and Interesting for the Audience. If you are a blogger working on multi-niche website and thinking to start a niche blog with a point of view to earn more and more money. Then this post is for you, read this post, understand your position and value of your multi-niche blog and then decide whether you shuld opt for niche site or not. I will prove you all in this post what I want to say. There are lots of general websites who are enjoying #1 position in all major search engines by competing the niche sites. But here I won't give any example of those sites, I will show and prove this fact with the stats of my own blog Tips2secure, which you are reading right now. 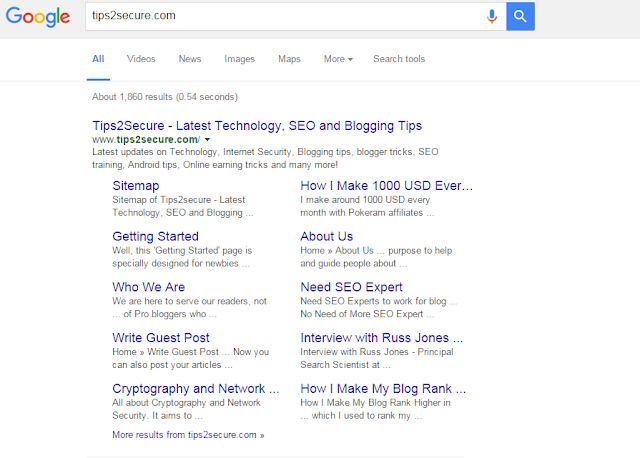 Tips2secure is a multi niche blog. 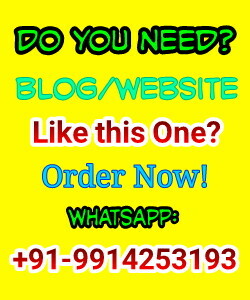 I write here articles on blogging, SEO guide, Android phones, templates, blogger widgets, making money online, social metworking site tips, review of products, investment sites and many more. Today, I will show you how Tips2secure is being ranked for more than 500+ keywords, almost in every category that I mentioned above. 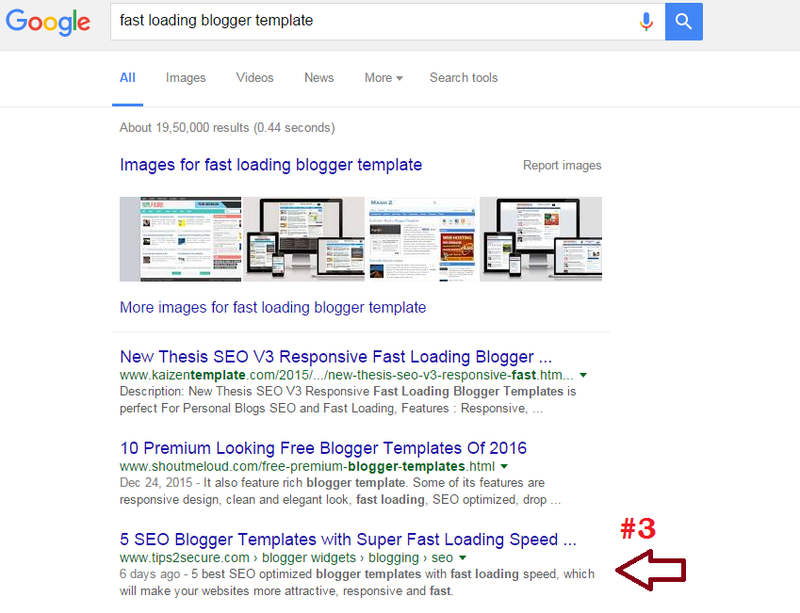 Here is the list of some branded keywords for which tips2secure enjoying rank on first page of SERP (#1-#10). I am sure after seeing and studying these examples you also start thinking like me. 1. 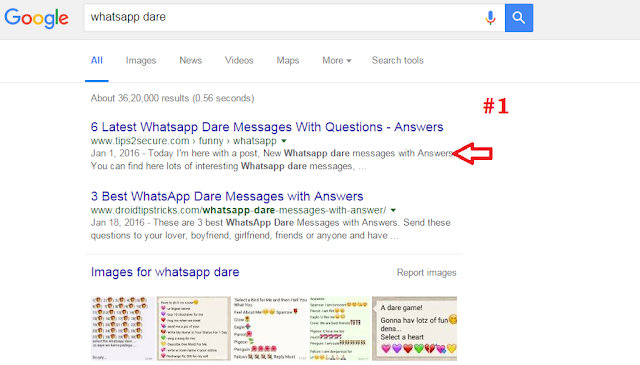 Keywords: Whatsapp dare, Whatsapp dares, whatsapp dare messages. Tips2secure is enjoying #1 rank in all major search engines for these keywords. Note, these keywords are related with Social networking site and tips. Tips2secure has ranked on #3 position in Google for these keywords. Have you noticed the difference in both keyword categories? I would also like to mention here, this blog is ranked for #3 position by competing lots of high authority niche sites working just on blogger templates. There are total 1,950,000 number of results for these keywords. Ask a question yourself, if only niche sites perform better then how tips2secure has ranked top by competing the niche sites? These two keywords are from Investment niches. This blog has been ranked #1 for compound fund review and #4 for pokeram review. Note this and keep comparing. This keyword is going viral these days because of low CPC in adsense. 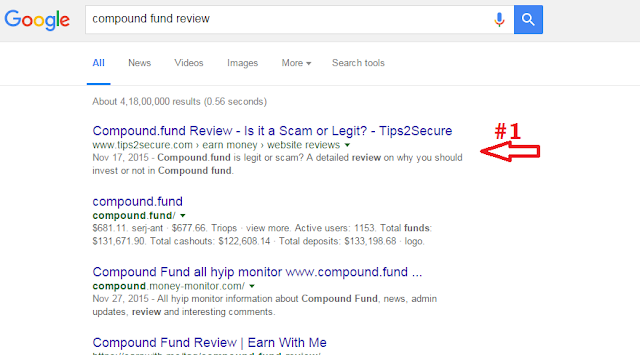 Again tips2secure is ranked #2 for this keyword and getting huge amount of traffic. Ninja blaster is social marketing software. 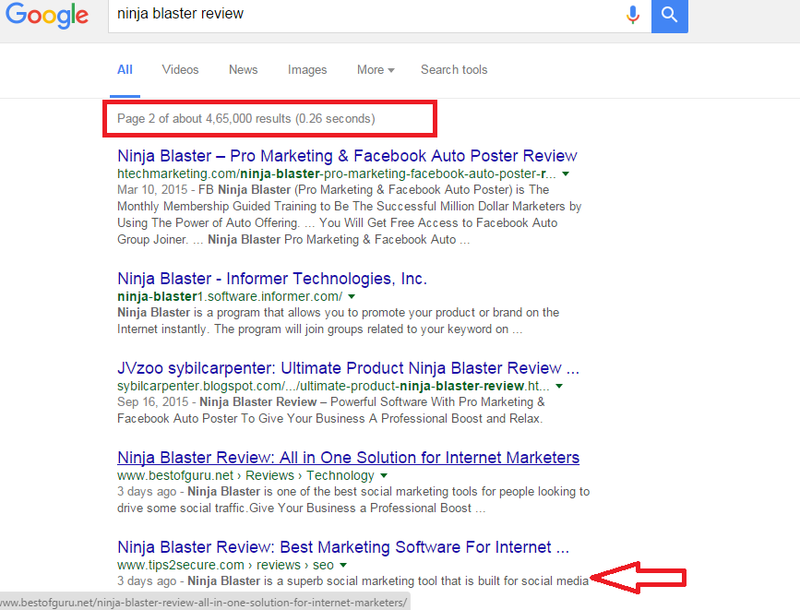 Few days ago, I posted a sponsored post on this product and after 24 hours tips2secure had ranked #13 for the keyword 'Ninja blaster review' by competing hundered on niche sites. Sitelinks are hyperlinks to website subpages that appear under certain Google listings in order to help users navigate the site. The site owner cannot add any sitelinks; Google adds them through its own secret automated algorithms. Here in below screenshot you can find sitelinks of this site by Google. I hope, now you might have understood that multi-niche sites also be ranked well if we do the things correctly and in ethical ways. There are also lots of benefits of using multi-niche blogs like more advertising opportunities, lots of contents, more freedom, more ideas and the main thing is more revenue for longterm. If you are blogger and in the habbit of reading other bloggers articles to learn more about blogging then no doubt, it's a very good idea. But just learn only positive things from that posts. Mostly newbie bloggers try to copy the successful bloggers. If they read failures of any blogger then they also think like if that person could not do that then how I can? No, no if he was not succeeded in this ways then I also can't? And this is the main reason of why new bloggers quit blogging after 3-4 months. Blogging is nothing to copy and work like other bloggers. Blogging is an art of sharing your ideas, interest, hobbies and knowledge with other people. Why you treat blogging like a business at start and always being tensed? Blogging is not a headache or only for money but it is a good way of communication and passion. It is not any investment plan. Why you think like if you do invest on buying paid domains, writing the same articles, sharing links on social sites will generate money for you after 3-4 months and you are going to multiply your investment. Why you do copy to others? Why you think you can't succeed with new ideas? You know what, if you are not doing something unique and different in blogging, you can't be succeed and it's a bitter pill for to swallow. Ranking is based on quality of site, number of contents, quality backlinks, speed, design, readers engagement, and many more other factors not only on the niches. Message: I hope that you have enjoyed 'Niche does not always matter in Google Rankings: Case study' article. However, if you want me to deliver more items, then please share my post. You can use Social Sharing Widget provided at the end of every post. After all, Sharing is Caring! awesome post you have, thanks for letting me know about, your words resonates me.